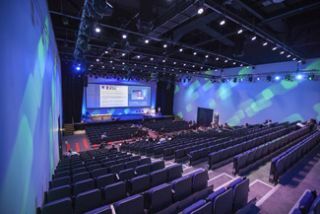 The Scottish Exhibition and Conference Center (SECC) located in Glasgow, Scotland, provides a wide range of conference, exhibition, and concert facilities. Recently, the SECC updated its most commonly used venue, the Lomond Auditorium, which 624 seats for events and conferences. As part of the project, the SECC installed Analog Way’s NeXtage 16 presentation mixer with soft-edge blending capabilities to serve the 12x4m projection screen fed by four Christie 8K projectors. In terms of application, the NeXtage 16 is used to do soft-edge blending projections and to create PIPs. Controlled through the Web RCS, Analog Way’s user-friendly graphic interface, the NeXtage 16 is operated by external technicians.